Clean and contemporary, this silver accented globe presents a modern twist on a classic design. 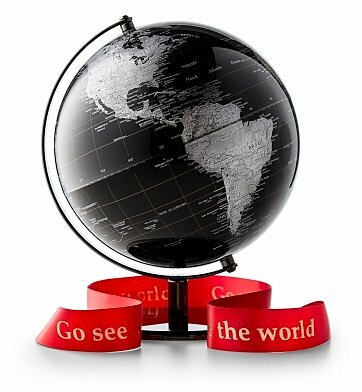 With a hand-tied satin ribbon imprinted with the message "Go See the World", it's perfect for a graduate, host, a housewarming gift or your favorite adventure spirit. Contemporary Black Desk Globe, 12"h x 9.5"d.
Custom Ribbon with "Go See the World" Message. Your gift is securely wrapped to safeguard the shipping process and arrives presentation-ready with a satin ribbon with the phrase "Go See the World" imprinted on the surface. A complimentary card with your personal message is included with your gift. Adventurer's Desk Globe is a hand delivered gift. These gifts are delivered by one of our local design centers located throughout the United States and Canada. Same day delivery is available for most gifts when ordered before the cutoff time. The cutoff time for Adventurer's Desk Globe is in the recipient's time zone.